Some 1,245 delegates from 99 countries at the Second Congress of IndustriALL Global Union in Rio de Janeiro took a strong stand against trade agreements that fail to protect the rights of workers, including the Transatlantic Trade and Investment Partnership (TTIP), the Trans Pacific Partnership (TPP), the Trade in Services Agreement (TISA), and the EU-Canada Comprehensive Economic and Trade Agreement (CETA). "IndustriALL calls on all its affiliates, especially those in TPP countries, to initiate and join public protests against the TPP" ahead of a vote in the U.S. Congress, the Congress affirmed. "TPP must not be ratified." 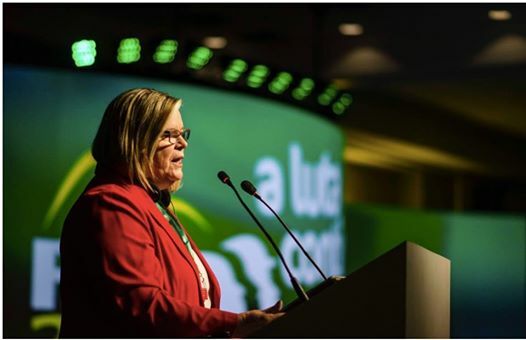 Addressing the delegates, USW International Vice-President Carol Landry - who was elected Vice-President for IndustriALL's North American region at the Congress - condemned the Canada-European Union agreement, which faces a decision by European trade ministers on October 18. "A vote for CETA is a vote to silence the voice of workers," Landry proclaimed. "We call on IndustriALL and especially all of our European sisters and brothers in this room to stand in solidarity with workers in North America and publicly demand that your governments reject CETA now." IndustriALL also opposed granting Market Economy Status to China and demanded stronger anti-dumping measures to address rampant overcapacity in steel, aluminum and other industrial sectors. The Congress, which met last week, called for strengthening global agreements with multinational employers to protect worker rights. USW Canadian National Director Ken Neumann congratulated IndustriALL on the success of the Bangladesh Accord on Fire and Building Safety, negotiated with global apparel brands following the Rana Plaza fire in 2013 that killed nearly 2,000 workers. Calling the accord "a model for global agreements" that is enforceable through binding arbitration, Neumann advocated expanding the agreement to strengthen organizing and bargaining rights. The Congress delegates welcomed former Brazilian President Lula da Silva, who has been targeted by the country's unelected government in a campaign of political persecution. The delegates elected a new leadership slate including Valter Sanches from the Brazilian metalworkers union CNM/CUT as General Secretary and Jörg Hofmann from the German IG Metall as President.